As we all know, Texas and Florida have been hit pretty hard with hurricanes. There were a lot of people and pets who were unable to leave and now are displaced and homeless. A lot of us are feeling a bit helpless, not knowing how to help. Not knowing which organization is a good one to donate to. Some don't want to donate money but rather donate items that will be used by survivors. One of our customers has made some local connections in Texas to send quilts to be distributed to those in need. This person is reliable and will be able to ensure the donations are given to folks in need. We are waiting for things to calm down a bit in Florida and Mom has some friends and old classmates she is going to reach out to in order to find someplace to send some quilts down that way, too. The quilts will be sent to small individual organizations to ensure people who need them get the quilts. We are doing this anonymously. We are doing this out of the heart not for any publicity. To help out, we have ordered some thin poly batting to keep people warm but not too warm. We will keep you posted on it's arrival. We are asking you to limit the quilts to these sizes as these folks will still be moving around and don't need anything to big to have to lug around. We are also recommending that if you are using your own batting, to please use thin loft batting as the quilts are going to areas that stay fairly warm to hot year round. We are also recommending making the quilts into quillows so that the quilts will stay folding while being transported from place to place, making it easier for folks to carry their quilts. Quillows are very versatile, folded up they can be used as pillows, a cushion for their bum, something soft to put behind their backs when sitting against a hard surface, etc. Here is a link on instructions for making a quillow. There are also several videos on YouTube. If you would like to make and donate any quillows, you can drop them off at our Shop and we will see that they get to the proper organizations. 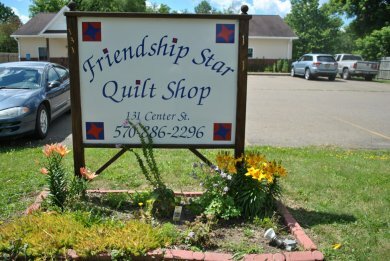 We will give a 20% Off coupon on one regular price item for donated quilts. Coupons limited to up to 4 coupons per person. You may donate as many quilts as you like but we are only able to give out a limited amount of coupons per person. Our goal is to have the quilts ready to send out by mid-October. We are still going through the final planning stages.